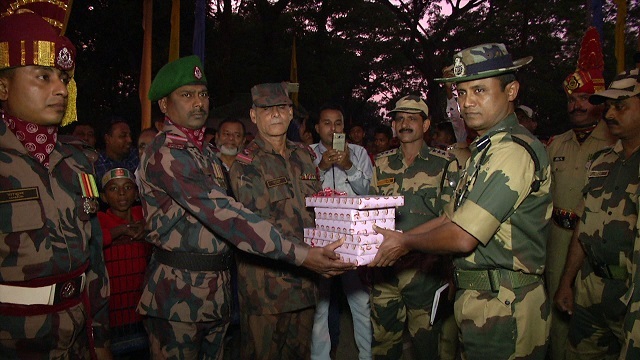 As goodwill gesture on the occasion of Vijay Divas (Victory Day) troops of paramilitary Border Security Force (BSF) and Border Guard Bangladesh (BGB) stationed along the India-Bangladesh border at Akhaura in Tripura exchanged sweets with each other. After the flag retreat ceremony between the two border guards, Commandant (CO) of BSF 120 battalion Subrata Singh gave sweet boxes to Border Guard Bangladesh (BGB) official Badrar Uddin Company Commander of Akhaura while greeting them on the occasion of Victory Day which was celebrated on Saturday. He also greeted all residents of Bangladesh on behalf of BSF. The gesture was equally reciprocated by BGB officials and jawans. To enhance bilateral relations the exchange of sweets between India and Bangladesh along the border in Tripura border is an old and traditional gesture to show goodwill between the two nations and has been in practice for many years now. BSF and BGB also exchanged sweets and greetings on several other occasions including Diwali, Eid, Holi, Independence Day and Republic Day. Observed on December 16 every year, ‘Vijay Divas’ marks India’s decisive military victory over arch-rival Pakistan that led to the creation of Bangladesh as an independent nation. Bangladeshi people gratefully recognise the role of Indian army in helping them defeat the brutal Pakistani army. It was also on this day that the largest military surrendered after World War II took place, when the General Officer Commanding-in-Chief Eastern Command, Lt Gen Jagjit Singh Arora accepted the instrument of surrender from Lt Gen AAK Niazi of the Pakistan Army at Dhaka.